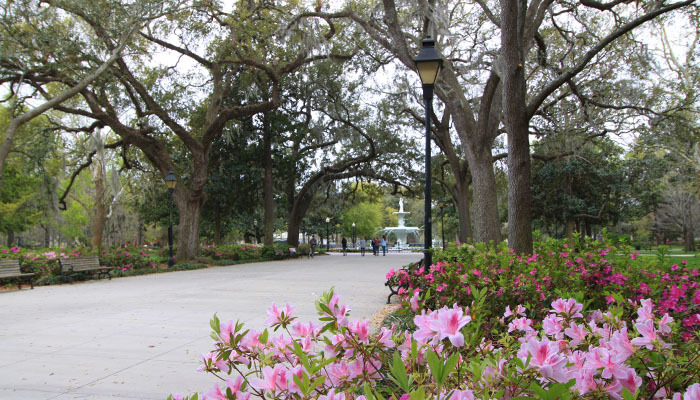 Spring has arrived in Savannah, and though the live oaks and Spanish moss are signature to the city year round, the flowers steal the attention this time of year. The warm weather has brought the squares and streets to life with an abundance of flowers unique to the South. Whether you are here for festivals, family, or vacation, the radiant flora will surely make your trip. Masses of azaleas bloom in early March, and continue throughout the rest of the month. As a trademark to Savannah, they can be found seemingly every place you turn. They line the roads and walkways in Bonaventure Cemetery, creating a hauntingly beautiful contrast to the marble and stone graves. They can also be seen in Forsyth Park, popping out against the green foliage, and all over the Historic District squares and streets, as their vines spill out around cast iron fences. With their bright, brilliant hues of magenta and red, azaleas are impossible to miss here. Camellias are another flower that are a symbol of the South. 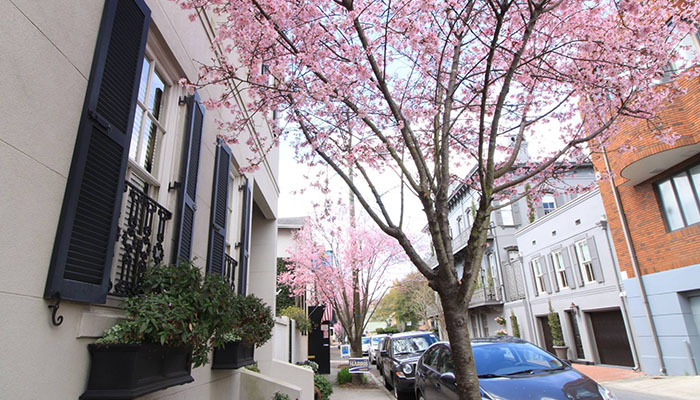 These beauties have a long blooming season, and can be seen in Savannah as early as the fall and winter months, though they come to full bloom in mid-February. The common camellia come in various colors: white, peach, red, pink, etc. and love the rich Southern climate. 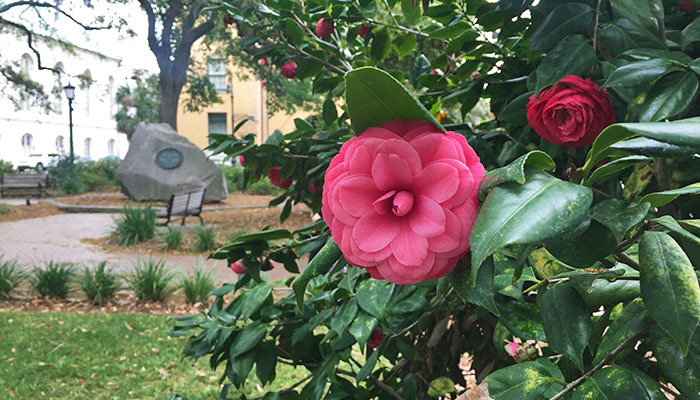 Though there are many different kinds, the common camellia seen around Savannah has delicate, curved petals that spiral outward from the center and look as thin as tissue paper. They can be spotted in most squares on Bull Street, Bonaventure cemetery, and other residential areas. Dogwood trees rival the allure of the oaks and moss in the spring, when their buds blossom into crisp white (sometimes red or pink) flowers. The first sight of their flowers is a telling sign that winter is officially over. These trees stand out strikingly from the greens and grays of the other trees in the area, and particularly against the sunny, clear blue skies of Savannah. 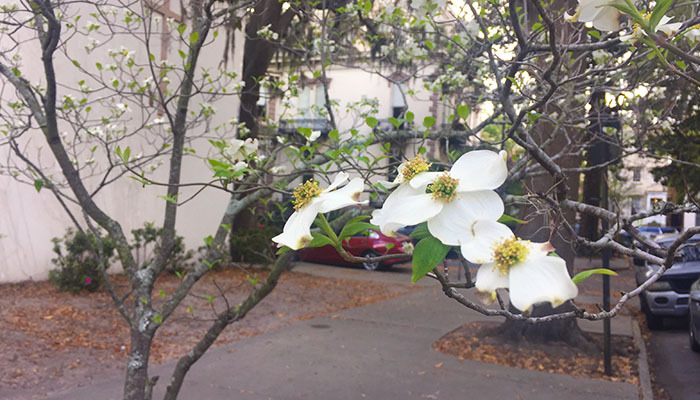 Some of our iconic dogwoods can be seen off Telfair Square, in Colonial Park and Bonaventure cemeteries, and around Forsyth Park. These are just a handful of the endless amounts of flowers that turn an already beautiful Savannah into a stunning Savannah during spring. Other flowers like gardenias, jasmine and wisteria can occasionally be spotted throughout residential areas. So keep your eyes peeled on your next visit, Savannah in bloom is an experience you won’t want to miss.